SOLD- 4 Dexter Row. Charlestown-Boston, MA - Quincy Real Estate, South Shore Real Estate, SALES & LEASING! Located in the heart of Charlestown, steps from the best restaurants and shops & the “T”, this one bed penthouse has an additional loft space & overflows w/ character & charm. Featuring exposed brick, wide pine floors & unobstructed views of the Bunker Hill Monument & the Boston skyline, this rare to market home is one of a kind. Warm & Inviting living has wide pine hardwood flooring, large baseboard molding, views of the Boston Skyline, & ample storage. 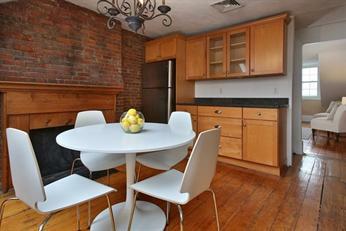 Eat-in kitchen is light-filled & boasts 2 skylights, unobstructed view of Bunker Hill Monument, ss. appliances, cherry cabinetry, granite countertops & can fit large table. Spacious master w/hardwood flooring, white wood mantle, a deep closet, w/d & views of Boston. Bath w/tub/shower &tile surround & skylight. Light-filled loft has spacious bonus area w/versatile living use. Expansive, shared yard is the perfect place to rest & relax. Cent. air, ample storage, w/d in-unit, outdoor space & sought after location, this home is a must see!